A 300KM mercy dash from Brisbane by an intensive care unit team has helped save the life of a Hervey Bay grandmother. 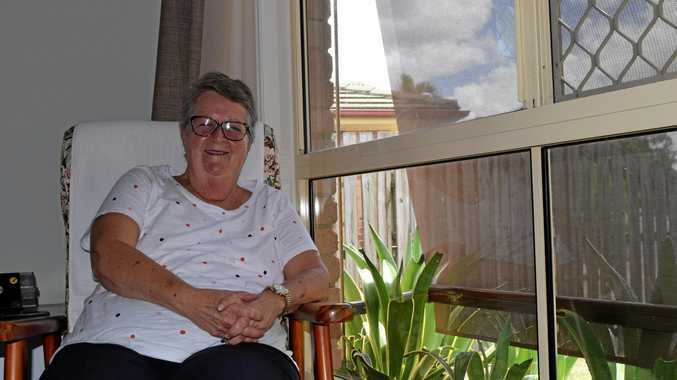 After Hervey Bay's Beryl Harradine was admitted to hospital in September last year with lung complications from a severe case of pneumonia, doctors feared the worst. But Ms Harradine is alive to tell the tale after four clinicians at the Prince Charles Hospital's Intensive Care Unit bundled up life-saving oxygenation equipment and drove four hours to Hervey Bay to help deliver the life-sustaining therapy. The mobile Extra Corporeal Membrane Oxygenation (ECMO) equipment was essential for the proper functioning of Ms Harradine's rapidly-deteriorating lungs. Doctors were also required to help solve a heart defect called Ebstein Anomaly, which effectively left a hole in Ms Harradine's heart. If not for their actions, she would not have survived. Ms Harradine told the Chronicle the doctors had effectively saved her life. "I was in a coma for nearly a fortnight while they were patching the hole in my heart,” she said. Since the incident, she's settled back into her routine of going for walks and exercising with her friends. "It's just good to be breathing poperly and start walking again,” Ms Harradine said. Dr Jayshree Lavana, one of four clinicians to make the trek, said the team worked closely with the Harvey Bay Hospital ICU doctors over several hours on various treatment options to try and improve Beryl's condition. "When we arrived, she was far more ill than we had originally anticipated,” Dr Lavana said. "While the pneumonia had led to poor oxygen supply to her organs, Beryl had a congenital heart condition, that caused a hole in the heart to open, which had exacerbated her situation as her heart began to fail. The ECMO treatment involves inserting large medical tubes into the heart via blood vessels in the patient's groin to oxygenate blood and remove carbon dioxide. In Ms Harradine's case, it also provided support for her heart by pumping oxygenated blood to her vital organs. "This was an incredible team effort and without such a well-co-ordinated effort... Beryl would not be alive today,” Dr Lavana said.